When Rut came to the USTA National Campus here in Orlando to inspire our entire Player Development Coaching Staff (the Elite/Professional side of the USTA) under the guidance of the guru himself, Jose Higueras, we knew we were in for a treat! Thank you so much, Rut, for your passion in mentoring and guidance towards the Team-Life and what it is to embrace ones fears. A very powerful presentation that really resonated with coaches my age who have always had such respect for the Special Operators growing up. The story I am about to share hits me deep and to my core. This young man has shown resiliency at the highest level and has challenged my coaching abilities and my ability to truly connect with compassion with my athletes. My job at the USTA is the National Manager and Head Coach for Team USA Wheelchair. I head up the Paralympic side of the USTA. The Olympic/Paralympic Games in Tokyo next year, will be my fifth Paralympic Games. Chris Herman, the young man who’s story I am about to share with you all, is vying for a slot on that team for his first Paralympic Games. We first met Chris as a chunky 14 year old kid with some real promise out of St. Petersburg, Florida. He attended our ITF/USTA Junior Wheelchair Tennis Camp of the Americas at my home club in Mission Viejo, CA. He had skills right out of the gate, but needed guidance and had to mature some physically. Little did we know within two years at the age of 16, he would go on to become the #1 Junior Boy wheelchair tennis player in the world. Chris was injured at the age of 10 when he was in a car accident with his entire family. I don’t know the exact details, but he attained an incomplete injury at the T-12 level of the spinal cord. Not a complete severing of the spinal cord, but permanent damage none the less and he cannot walk, obviously. Chris came to wheelchair tennis a year after the injury and us at the USTA three years after that. Understanding what he had to endure, having been an extremely active kid, playing multiple sports, to having to reinvent his entire life, in every way, at 10 years of age, seems like an impossibility. What his parents and siblings had to endure as well with this entire life transformation, is almost incomprehensible. They still have to endure it to this day. The guilt and the stigma of disability is now a permanent fixture of their lives. Life in a family with disability present is amazingly difficult both emotionally, spiritually, financially and psychologically. For everyone. This is especially true if there was “trauma” that brought this disability into this family’s reality. As Chris progressed and continued to grow as a fine tennis player in his early teens, and after reaching the pinnacle of World #1 Junior boy, something terrifying happened. For all young persons with disabilities who sustain their injury pre-puberty, unfortunately, when the growing begins, they will not have the muscular or skeletal structure that will keep their spine growing in a straight line, as it normally does. It was at this time that we all noticed that Chris was beginning to list to his right side. Surgery was going to be needed to correct his posture. This involved an 8-10 hour surgery of placing titanium rods from the base of his pelvis, all the way to the base of his neck, along the immediate sides of his spinal cord/vertebrae, in order to give structure to his spine. This is an absolutely necessary surgery. Otherwise, internal organs would begin to rest upon one another and cause massive complications. Not having this surgery would not be an acceptable choice. Chris knew that and also understood that his “function” level would change AGAIN, this time at 16 and not for the better, at least athletically. This will be twice within a lifetime, a very short lifetime at this point, that Chris has had something taken away from him. His post-op situation involved him being on his stomach for the better part of 6 months. Caregiving was done by his parents 24 hours a day. The constant threat of pressure sores and risk of clotting or infection was ever present. Going from being #1 in the World, to being cared for 24 hours a day for 6 months was almost too much to bare. Chris, however, is not your typical kid. He was driven to get back on to the court, after some physical rehab, to begin the rebuilding of his body and his tennis skills and ranking. 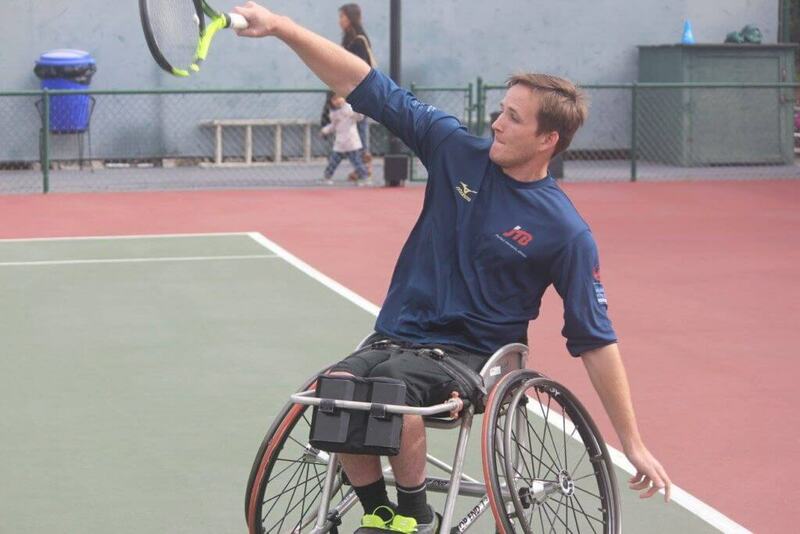 As of today, Chris is a member of our very young Team USA Men’s Program and a member of a back to back Championship Junior Team that won the BNP Paribas World Team Cup Junior World Championships (wheelchair tennis’ counterpart to the able-bodied sides’ Davis Cup and Fed Cup) in 2015 and 2016. He is currently a sophomore at the University of Florida, studying Economics. PrevPreviousA SEAL gave me purpose again.